The start of a new school year brings about change and growth for many kids. Whether your child is attending a new school or starting a new sport, there are many things to be excited about. A trip to your Sunset Hills MO orthodontist, however, is not something children always look forward to, especially if getting braces is on the horizon. Luckily, our Sunset Hills orthodontist knows how to make kids excited about wearing braces. One way to increase the excitement level about wearing braces is to educate your child on the available options. In the past, metal braces dominated the market and left much to be desired by the wearer. Nowadays, metal braces have undergone a transformation, leaving them less bulky and less noticeable. For those who still want to explore other avenues, there are several options to choose from when you visit our Sunset Hills MO orthodontist. Invisalign is the final option offered by our Sunset Hills MO orthodontist and uses a series of nearly-invisible trays to straighten your teeth. This option is not offered to young children, so it should only be considered for older children and adults. Even with other available options, metal braces are still among the most popular. 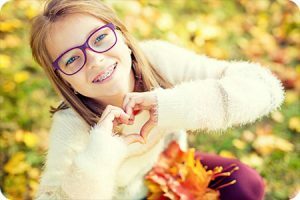 If your child has chosen metal braces, colored bands are the main way to increase excitement, plus allow them to express their individuality. Is your child’s favorite color lime green? No problem, bands are available in every color of the rainbow at our Sunset Hills orthodontist. Your child can mix colors to their liking and change them up at each appointment. With the advancements of modern-day Orthodontia, there’s no reason for your children to dread getting braces. Reach out to our Sunset Hills MO orthodontist today for more information! The information provided in this article is not meant to be medical advice and is for educational purposes only. If you would like to learn more about this and other topics related to orthodontics, feel free to contact Borello Orthodontics, with a convenient orthodontic office near Sunset Hills MO, by clicking here or by calling 314.821.2400.